So I was in the card aisle once again and look what I saw! Yup! 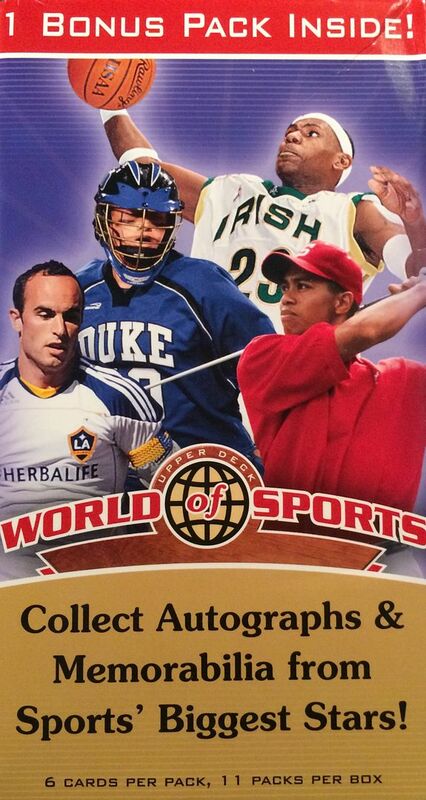 More boxes of World of Sports on discount! Maybe the folks over at Target headquarters saw that my Target in Woodland sold out of their stock pretty quick so they got some more over to them stat. If that truly is the case then... wow... consumer tracking and inventory technology has definitely sped up in recent years! My last two blasters of Upper Deck World of Sports yielded me two jersey cards. 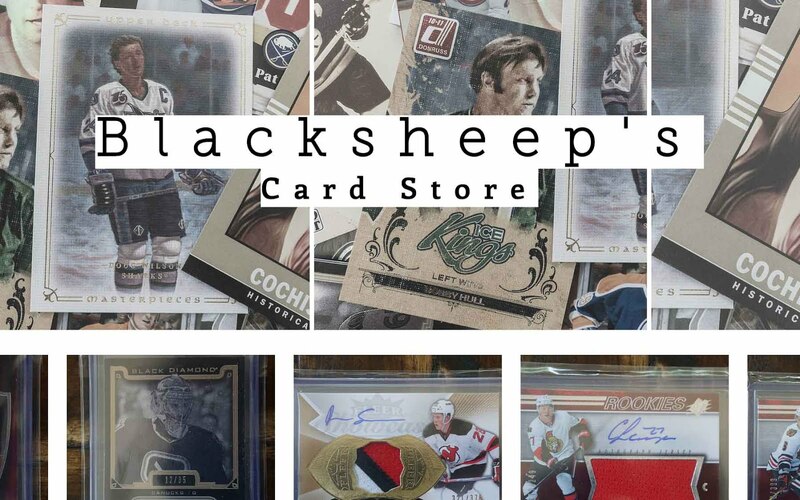 Hey, if they are going to be spitting memorabilia cards out at that rate, then I'm definitely in! It's always fun to get some sort of hit in a blaster. And with World of Sports, you never know what kind of material you'll get as there are many sports represented in this product. It would be nice to hit an autograph though. Jersey cards are nice consolation prizes, but an autograph is really what I am after when I buy these blasters. The front of the box has a picture of a Jordan autographed card. Of course, that's not going to be in there unless I am extremely lucky... but there is always that slim sliver of hope. I think these boxes are fun... and yes, I know that many people don't, but I certainly get a kick out of them. 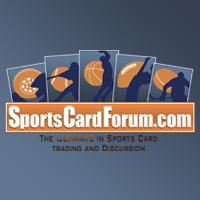 Well... if you weren't into World of Sports before, this blaster would do nothing to help you get into it. It was terrible. Every single card was just a standard base cards. Being a mixed set, the player selection can be decent, but overall getting all base cards in a blaster is not a good feeling at all. There wasn't even an insert card tossed in. IT WAS JUST ALL BASE. I had some decent hopes for this blaster as you know from what I wrote above. I just can't believe nothing really came out of this blaster since my last two at least had a jersey in it. It just goes to show that with retail, it's a huge risk with very little reward. Besides the World of Sports blaster I got a pack of 13/14 UD Series 2 for fun. There was a canvas card in that pack, but it wasn't anything of note. 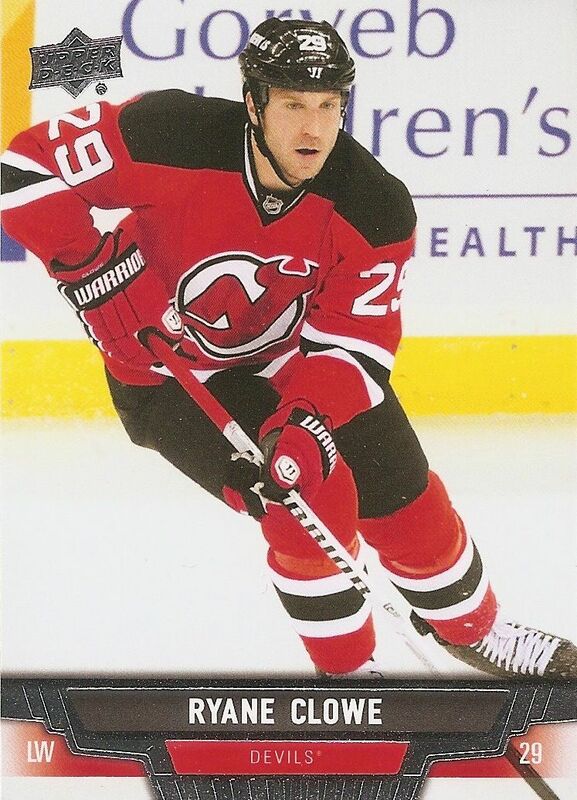 I did like this Ryane Clowe base cards though. 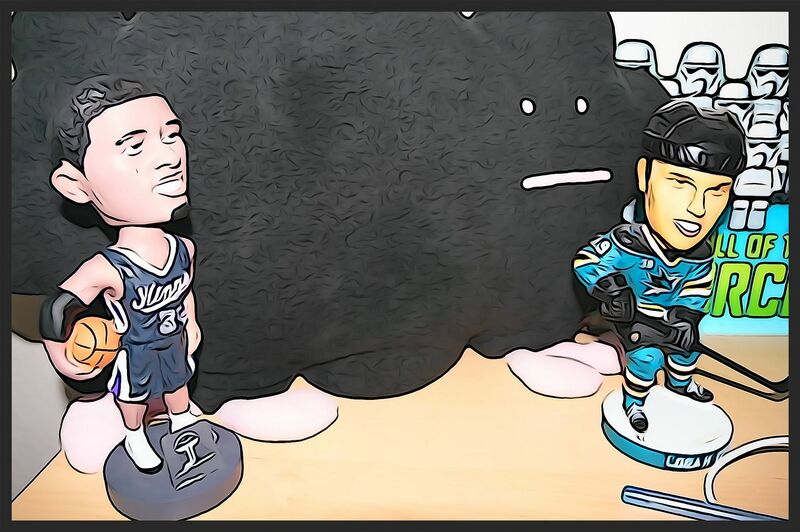 Man... Clowe was one of my favorite Sharks when he was with the team. 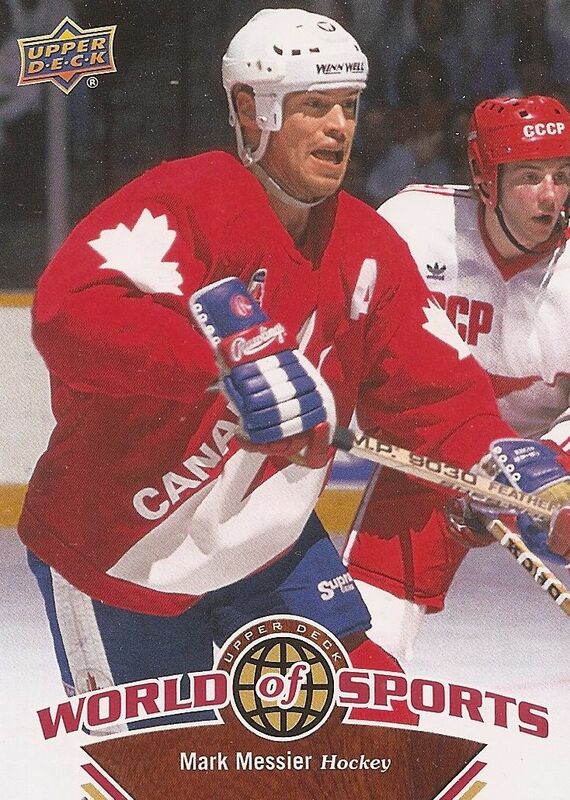 This is a a pretty cool card of Mark Messier. To keep with the 'world' theme, Upper Deck put all the hockey players included in their national jerseys. Here's Messier in his Team Canada colors facing off against the Soviets! 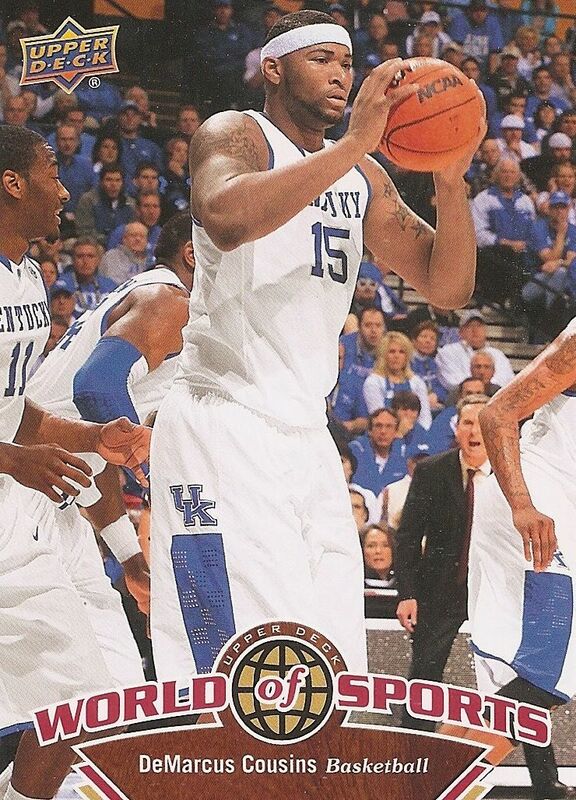 I really didn't expect to find a card of DeMarcus Cousins in this blaster. I've become quite a Sacramento Kings fan as of late, so getting the Big Cuz was neat for me. Yes, it's not a big card at all, but in this break it was my favorite pull. So yea, pretty terrible break! Getting all base cards in a blaster is not good. As a customer, you're going to be pretty sour about this. I know I wasn't happy! If there had even been an insert card inside I think it would have made it a little more palpable, but to get absolutely nothing just leave me shaking my head. Oh well, better luck next time!